Excited to share a new organizational series of “Plan With Me” videos. 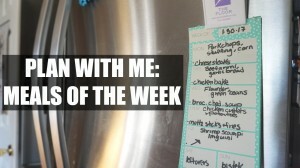 The first video in this series shares how I plan our meals of the week, meals for dinner and afterschool snacks/meals before dance and work. Be sure to check out my series of “What I cook in the week” episode 1 linked below. Stay tuned for a Plan With Me: Family Calendar and Plan With Me: Personal Calendar video next! Thumbs up and comment if you want more videos like this!